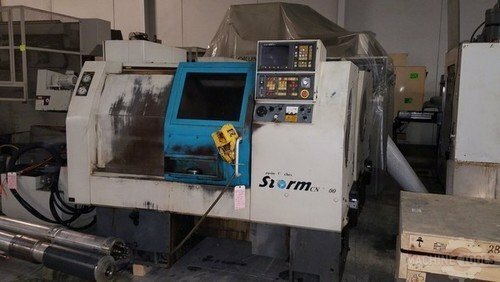 1996 Clausing Storm 100A CNC Turning Center With Tailstock. Machine is in good shape and can be inspected under power as needed. Options include: Fanuc OT control, 3J collet chuck, tailstock, chip conveyor, LNS 6.45 Hydrodynamic barfeed (12'), and miscl toolholders. Please contact: Bob Nelson at 847-921-3845, Brian Foerster at 847-800-4494, or Cris Mulvihill at 602-501-8995 with any and all questions.